How do I dry foam rubber items using my Dryer with MultiSteam, 7.4 cu.ft (DV50K8600EV)? The best way to dry foam rubber items (rugs, stuffed toys, shoulder pads, etc.) is to follow the instructions on the care label. If no drying instructions are provided, use Air Fluff cycle. Caution: Do not dry on a heat setting. Important: Drying foam rubber items with heat may damage it or cause a fire. Please be careful when you dry those items. 1. Place the items into the dryer. Important: To keep the performance and increase the lifetime of your dryer, keep dryer loads no more than two thirds of the drum's capacity. Half is even better. 2. Press POWER to turn the dryer on. 3. Press Air Fluff in the left-most panel. 4. Press START/PAUSE for 3 seconds to start the selected cycle. How to dry bedspreads/comforters using my Dryer with MultiSteam, 7.4 cu.ft (DV50K8600EV)? 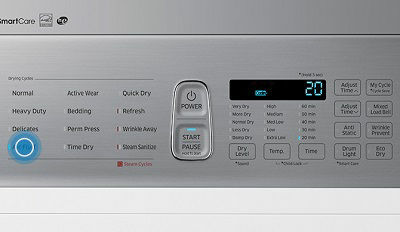 How do I dry pillows using my DV8600 Dryer with MultiSteam, 7.4 cu.ft (DV50K8600EV)? 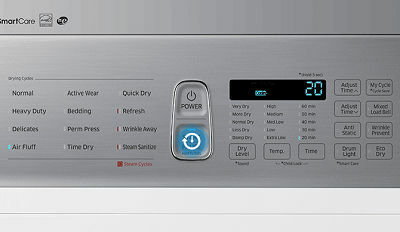 How do I dry blankets using my DV8600 Dryer with MultiSteam, 7.4 cu.ft (DV50K8600EV)?